Two to three storm systems will ride a strong jet stream into the West. Snow levels will rise as warmer Spring temps take over. In the Northeast, after the departure of a Nor'easter on Wednesday, colder air settles in temporarily with two smaller storm systems rolling through. A weak El Niño continues in the Equatorial South Pacific. In fact, sea surface temps actually cooled slightly since last week. The consensus of forecasts continue with a weak El Niño through Spring into early Summer. Two to three storm systems are lined up. The first rolls through Thursday afternoon into Friday morning with light snow accumulation at the higher elevations of Tahoe to Mammoth. The second storm system is stronger with heavy snow accumulation between Friday afternoon and Sunday afternoon. It's possible that warmer air filters in late Saturday through Sunday and that could turn some of the snow over to rain at lower elevations. Ski the higher peaks and higher ski resorts on Saturday and Sunday. Another snow is possible Monday night-Tuesday. Two storm systems are possible between Thursday and Monday. Temps look a little warm so ski the higher peaks and higher ski areas. Light to moderate snow accumulation is possible between Friday, Saturday and Sunday. A couple heavier pockets possible. It comes in waves and there will be breaks in between with noticeable lulls. A more impressive storm system is possible Tuesday-Wednesday. 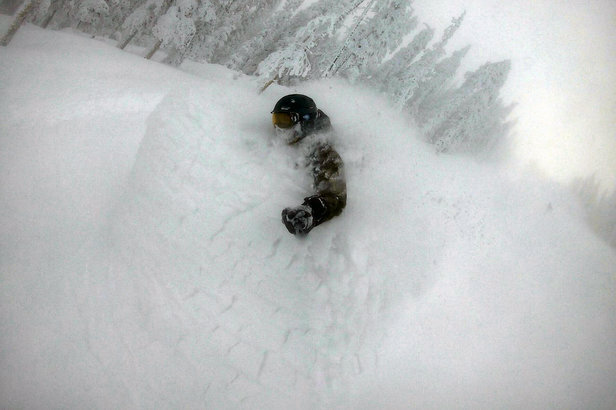 Ski Alta, Snowbird, Snowbasin and Park City on Saturday. Colder air settles in after a powerful Nor'easter. A wave of light snow rolls through between Friday night and Saturday morning. Saturday looks like a great ski day at Killington, Sunday River, Mount Snow, Okemo and Sugarloaf. A warmer storm system is possible between Monday afternoon and Tuesday. Two waves of snow are possible between Thursday and Monday. The first delivers light to moderate snow accumulation Friday-Saturday. 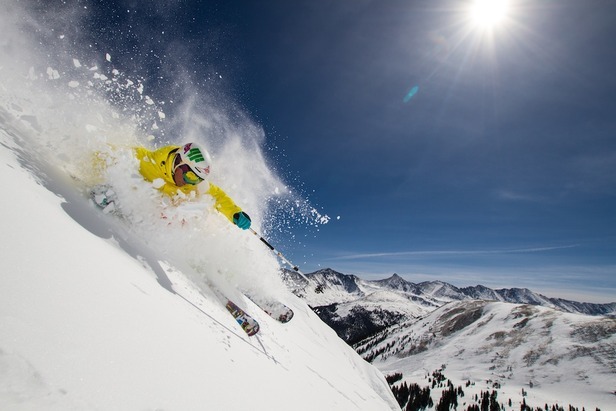 It favors Sun Valley, Big Sky, Bridger Bowl, Grand Targhee and Jackson Hole. The second wave is more impressive with heavy snow accumulation between Sunday and Tuesday. 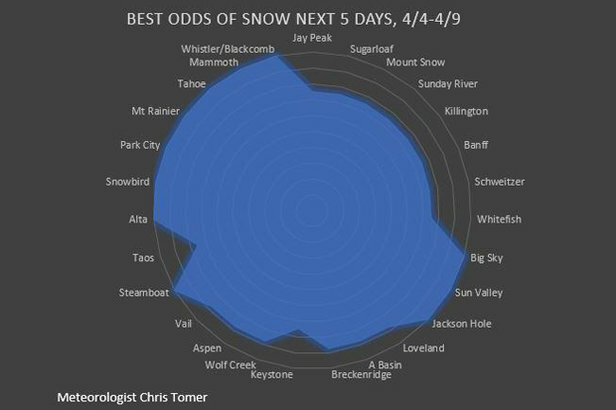 It favors Schweitzer, Sun Valley, Whitefish, Discovery, Big Sky, Jackson Hole and Grand Targhee. Colder air comes in behind this storm system. 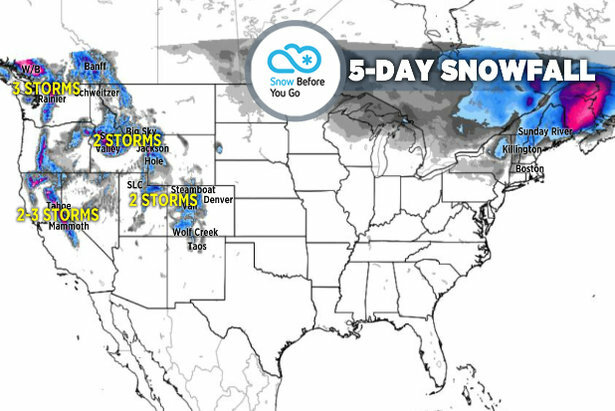 Two large storm systems over the next five days will keep the precipitation coming. Heavy snow is likely on the higher volcanoes and higher Cascade peaks. Warmer air at lower elevations will limit snow accumulation. Subscribe to get the forecast in your inbox every week! There's plenty of moisture over the next five days but snow levels could be an issue. The heaviest snow totals will be higher on the mountain. It's an active pattern with a few chances for snow. Light snow on Thursday is followed by moderate to heavy snow Friday afternoon into Saturday morning. Another wave of moderate to heavy snow is possible on Sunday. Then it's just light residual snow showers Monday and Tuesday.